A flurry of piano notes from the flying fingers of Kevin Bales open the first song in a tribute to the music of Fred Rogers. Who is Fred Rogers? You may more quickly recognize him if I call him, “Mr. Rogers,” the television celebrity who made so many children happy for nearly thirity-five years. This album shows us the jazzy genius of this man. His songs are smart, positive and melodic. Beginning with “It’s You I Like” that lyrically reminds us, “It’s not the things you wear, it’s not the way you wear your hair. It’s you I like.” You hear this song one time and already you can hum the melody. That’s the sign of an outstanding songwriter. Keri Johnsrud is the vocalist who interprets these catchy songs. Their trio swings hard and non-stop. Bales is an expert on the 88-keys and Marlon Patton rides the rhythm, fluent on his drum kit. Billy Thornton takes an impressive bass solo on this first song, after which, these four musicians have established their territory. What they bring to the table is laid out like a jazzy tablecloth on their very first tune. The group is Straight Ahead and no nonsense when it comes to their arrangements. True, Mr. Roger’s music catered to children on several shows like ‘Mister Rogers’ Neighborhood,’ ‘The children’s Center’ and ‘The MisteRogers Show.’ In fact, Kevin Bales and Keri Johnsrud grew up listening to these catchy melodies and poignant lyrics. A couple of years ago, in casual conversation, they realized both of them had enjoyed and become attached to the Fred Rogers compositions as children. Upon research, they discovered that Rogers had actually composed every song heard on his programs. His simple messages of friendship, love and emotional connections not only apply to children, but easily apply to adults. This is quite evident on tunes like “Just for Once.” This composition explores friendship and is arranged with exotic sounding drums beats, bringing to mind Ahmad Jamal arrangements and memories of Jamal’s popular “Poinciana” hit record. Patton employs mallets and the lovely softness they bring to music on “Find A Star”. 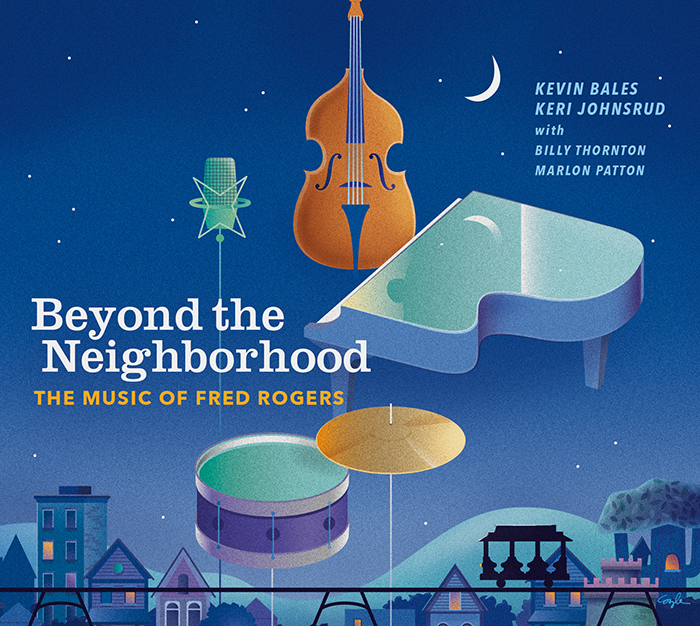 This is an album worthy of listening to, not only because the trio is talented and resourceful, but also because these arrangements establish Fred Rogers as a competent and sensitive composer/lyricist. Keri Johnsrud has a very pretty, pop voice and does a fine job of sharing the Roger’s melodies with us. However, I would not call her a jazz singer. That diminishes this production in a subtle kind of way, because the trio is definitely jazz. “Beyond the Neighborhood” has certainly awakened this jazz journalist to the music of Fred Rogers. So, I would acknowledge, mission accomplished!